Get your Georgia insurance license using an America’s Professor online training course. Our comprehensive video lectures, review questions and study guide will help you learn, and retain, the material needed to pass your Georgia insurance license exam the first time! Bail Bonds Only students are required to take a Casualty course and pass the Casualty exam. I studied this course in two weeks and passed the test on the first try. I am beyond happy with my results. My best advice is, read the chapter first, then watch the videos while you take notes, and DO NOT move on if you can not pass the quiz with a 90 or better. I did all of this and had no problems with the exam. I also said a prayer before each study session. GOOD LUCK to you all. This is an excellent course. I past the accident and sickness state exam the first test. I feel this class prepared me well. I am very pleased with there service!! The course was very easy to follow and fun at the same time! I would like to thank you for providing such excellent study material regarding the Georgia Property & Casualty Pre-Licensing Course. The video lectures were on point (with humor), very informative, and clearly presented. I took the GA P&C Exam today for the first time and passed!! I highly recommend this course!! Thank you again. PASSED AT THE FIRST TRY JUST LIKE I DID WITH THE LIFE AND HEALTH!!! Jackie boy did it again! Great job Morton! I studied for 3 weeks of which I was traveling for one entire week. To make up for it, I watched videos at the airport and in my hotel room yet I was able to pull it off. The PNC exam is pretty conceptual so don't memorize the practice questions, they can only get you so far. I felt confident coming into the exam and by the time I was finished there was doubt or hesitation that I would pass! I am done with all my exams! Thank you Jack! No doubt, America's Best Professor! This course is superior to anything that I have taken previously. Professor Morton is extremely detailed in his videos. He explains the chapter content in a very simplistic manner that will allow you to fully grasp the information. The reading along with the videos provides humor that you appreciate. Throughout the material you will see the statement “AP People Pass!” I think it could be an old Jedi Mind trick but I passed the test on my first attempt. I would like to thank the staff for their professionalism and quick response. This course was worth every dollar spent. Took my Ga Property and Casualty Exam on March 11th. Scheduled my Ga Life, Accident and Sickness 2 weeks later. Passed both exams on the first try!! Thanks AP!! I couldn’t have done it with out this course.. Jack you’re Awesome!! This course is amazing! I knew nothing about insurance before starting this course, and after finishing this course I was able to pass my Georgia Property and Casualty Exam on the first try! The course allows you to work at your own pace, and has practice quizzes at the end of each chapter that help you focus on what you really need to know for the exam. Thanks for all your help! I passed my Georgia Property and Casualty Licensing Exam! Tip for new test takers, a lot of times there are multiple correct answers, it is up to you to know which one is the BEST answer! Passed, the first time! I liked being to do this at home and whenever I could log in. That alone is worth the price. Just finished applying for my GA P&C Agent License. Thank you so much for preparing me – the online classes were entertaining and thorough and I was able to know exactly what I needed to ensure my answers were correct. I appreciate the level of knowledge from Jack Morton, and being able to tap into that. I took a week, and I listened to this engaging and informative videos series with 2 books included. I was pleasantly surprised that I was given a free yellow highlighter and pen as well. The staff always answered all my emails, and they are truly kind and caring. I passed my test in 36 minutes (allotted 2 hours) and feel great. I have already recommended this course, and I will use them in the future. AP teaches you everything you need to know for the exam in an easily digestible way so you can pass the first time! Jack Morton is a delight to listen to, he's an excellent professor. AP people pass! Jack Morton is the best professor ever Americas Professor is the fastest and most reliable course ever People say that they pass the exam at the 4th or 5th trial because this is a very hard course. I have bought from these guys and passed the exam at the first trial. You will fall in love with Jack's teaching and especially he is really fun to listen with the beautiful examples that he gives with his beloved wife Nancy. I aggressively recommend and never look for another course. Good luck! Please also check our frequently asked questions about the Georgia Insurance Licensing Exam. First and foremost, you need knowledge—that’s how to pass your Georgia insurance exam. There’s no way around it and no shortcuts—you must study diligently and gain the appropriate knowledge. Georgia differs from most states as one must take an approved pre-licensing course and earn a certificate of completion prior to taking the state licensing exam. You’ve come to the right place! America’s Professor (AP) has decades of experience helping students just like you pass their insurance exam and launch new careers (or expand existing ones) in the thriving insurance industry. Whether you’re going for your property and casualty insurance license or you’re already a licensed agent who wants to sell an additional product, such as life or health insurance, AP can help. Prepare: Decide which license you want to obtain and enroll in a comprehensive pre-licensing course online through America’s Professor. Pass: Each state, including Georgia, has its own licensing requirements, and all 50 states require you to be licensed in order to sell insurance or even discuss insurance transactions. The best way to pass the first time is to prepare with a pre-licensing course through America’s Professor that covers everything you need to know for the state of Georgia. Apply: Once you pass the exam, you can formally apply for your insurance license and start working! 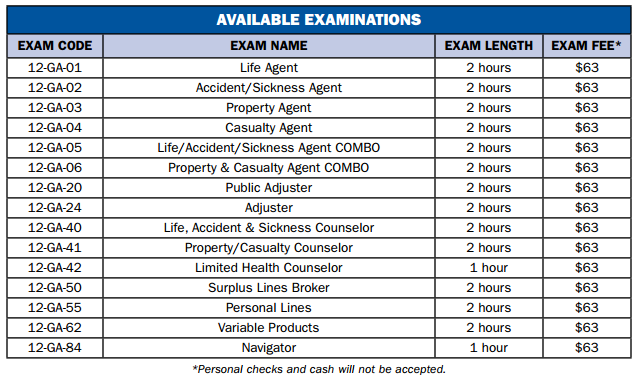 Georgia offers 6 different exams (Life, Accident & Sickness, Property, Casualty, Adjuster, and Public Adjuster). All exams require a score of 70 to pass, but note that each exam consists of two parts: a national insurance section, and a state-specific section. You will need a score of 70 on each section—the two scores are not averaged together. For more information about the number of questions and places where you can take the test, click here. Registration: You must register for the exam by calling Pearson VUE (the testing company) at 1-800-274-0488; it’s a good idea to call at least 3 days in advance of the date you plan to take the exam. Testing Centers: There are several testing centers in the state of Georgia and neighboring states where you can take Georgia exams. Call 1-800-274-0488 for up-to-date information about testing center locations. Licensing Fees: It will cost $63 to take the exam (each time you take it), you’ll pay a fee for fingerprinting of roughly $51, the Georgia Department of Insurance charges $100 per license type, and there is a $15 for administrative fee for the license application. Fingerprinting: Once you set up your text date you must make an appointment to get fingerprinted with Cogent Systems, Inc. (the fingerprinting company), online at https://www.aps.gemalto.com/ga/index.htm or by calling 1-888-439-2512. The electronic fingerprint fee is $51.00-$52.75 and typically one takes the test and gets fingerprinted on the same day.